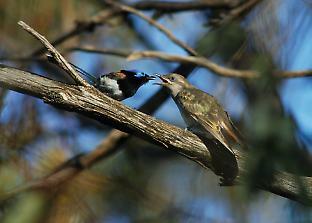 A fairy-wren feeds a hungry Horsfield’s bronze-cuckoo fledgling. To avoid rejection by their hosts, Australian bronze-cuckoo chicks are near-perfect visual and vocal mimics that can quickly modify their call to match the species they are parasitising. Naomi Langmore is an Australian Research Fellow in the Research School of Biology at the Australian National University.